Two cars are being compared in their ability to accelerate from 0 to 60 MPH. A Jetta and Porche will be accelerated from 0 to 60 in this experiment. We will keep track of how long (in seconds) it takes these cars to go from 0 to 60. 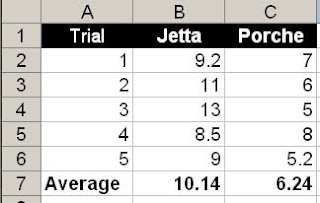 This experiment will be done 5 Times (5 trials) for each car. An average [=average(range)]time will also be calculated for all the trials.